Our leisurely wander within the Dartington Hall Estate had been a bit too leisurely. It was time to turn back. Where the stone wall ended, we left the woodland behind and turned left. There were open fields in front of us and not a soul in sight. By the path there was an impressive beech tree. The trunk was massive and elephantine. But it was something on that trunk that piqued our interest. I have been trying to get examples of Artist's Bracket only to consistently get the closely resembling Southern Bracket. 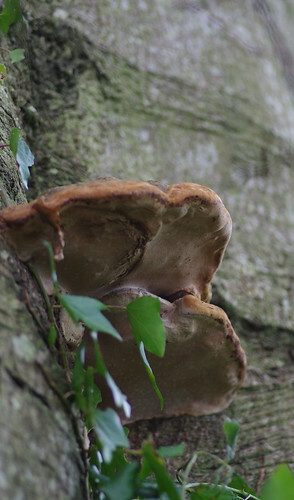 These were velvety above but very clearly warty underneath (as opposed to the generally smooth undersides of Southern Brackets). Two more views confirmed the sighting. 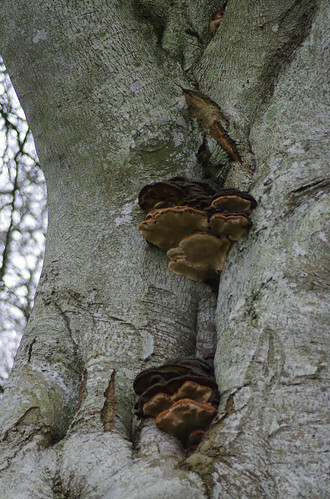 These were higher up and further round the same tree. During a mild winter there is still the odd flowering plant about in this part of the world. Bear in mind that we were still in a temperate (and predominantly wet January) before the February north-easterlies had us reaching for hats, gloves and scarves. There is something about the cris-crossing spirals and diagonals that is almost hypnotic (particularly when the tree trunk seems to twist accordingly with the pattern). By now we had reached the point of the stone wall. It was the same wall we had passed on the way out but remarkably we kept finding new species we had missed. 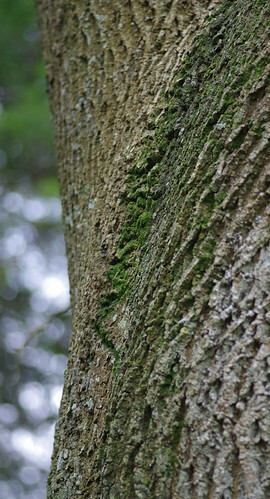 Collema fuscovirens is the black, granular lichen in the foreground. 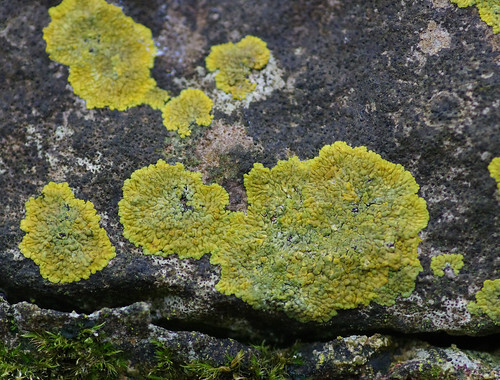 After the recent deluge that has seen many a Devonian wondering if they need to build a boat, many lichens look greener than they would otherwise. This is because the green algal part is more predominant. 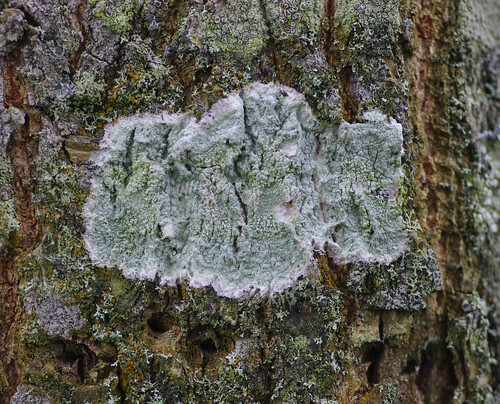 Consequently, lichens can be even harder to identify when wet! I see-sawed between these being Caloplacas and examples of Candelariella medians. We will have to try and record some dry specimens at a later date. We think this is most likely to be Dermatocarpon miniatum. 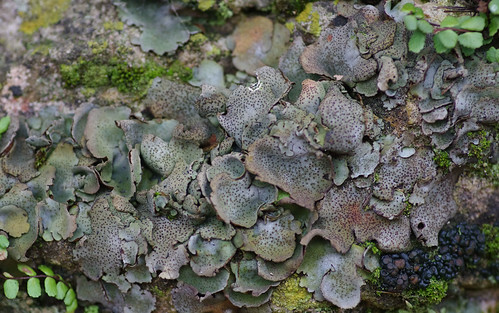 This species is also known as the Stippleback or Leather Lichen. 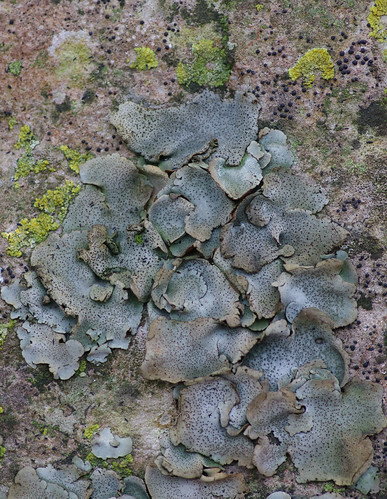 The black, nobbly protrusions in the bottom right hand corner are another lichen species called Collema tenax. 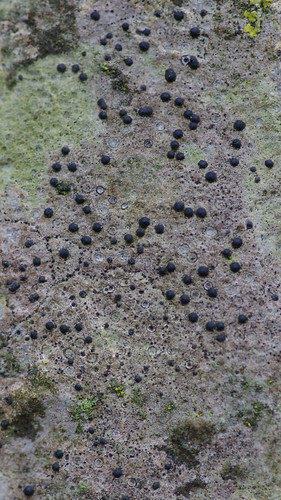 There are lots of black-button lichen species to choose from. The thallus is supposed to be pink when fresh. This is obviously an older specimen but the thallus retains a pinkish tinge. 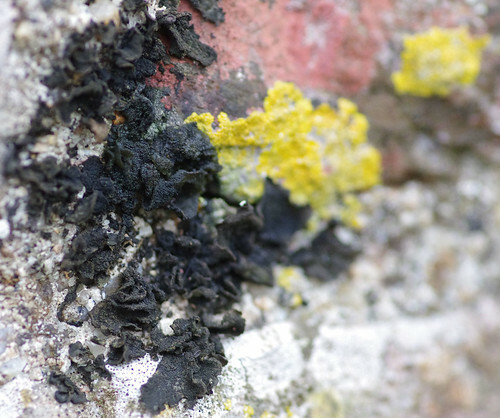 The black nobbly bits (or apothecia to get all technical) also have a tendency of falling out. They leave shallow pits in the surface of the rock. Rightly or wrongly, I am imagining they are the limpets of the lichen world. And then there are those that pose a challenge too far. 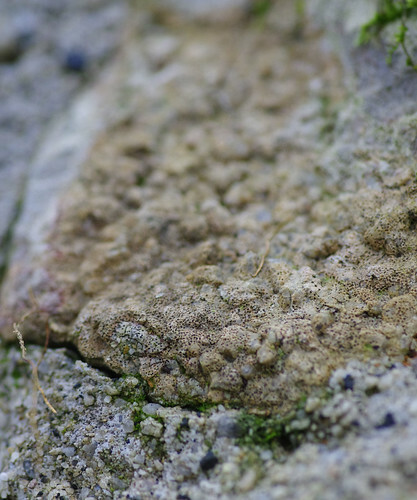 I used to see this sort of thing in a wall and not really pay too much attention, thinking it was the texture of the rock or even cement. 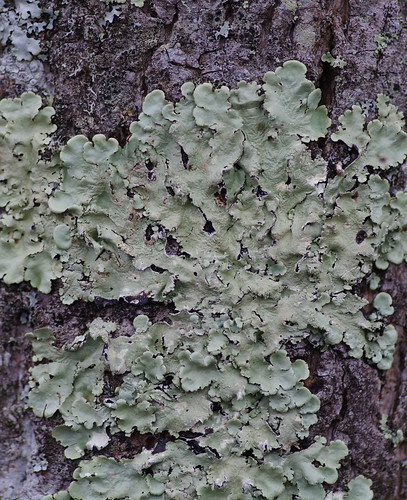 Now the reverse is probably happening: it is likely I am seeing lichens where none exist. 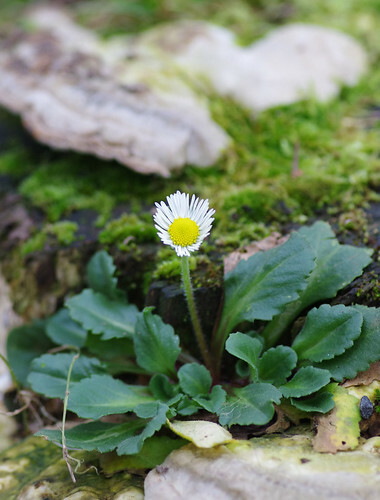 The humble daisy is often overlooked when its leaves are mostly concealed in lawns. There was something about this solitary specimen that really stood out. We left the stone wall behind and turned our attention to the roadside trees. This lichen reminded me of something you might expect to see in a limestone cave. We wandered along the road and decided an intermission was called for. As luck would have it a cafe came into view. We sat outside, and enjoyed bruschetta, olive tapas and coffee to a soundtrack of chattering jackdaws on the roof and the sight of oddly shaped mosses above, on slate tiles. 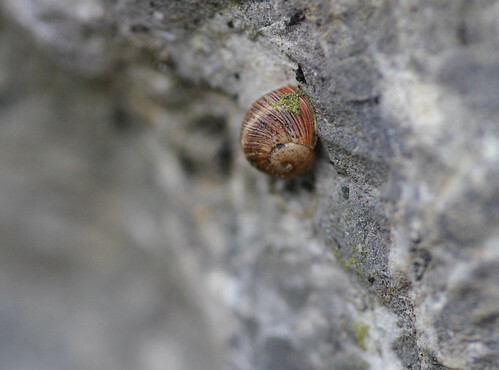 On the wall behind the bench where we sat, I spotted this mystery snail. The shell is clearly ridged and there's a faint line running through its middle. So I thought I would take a look around the wall and ground. 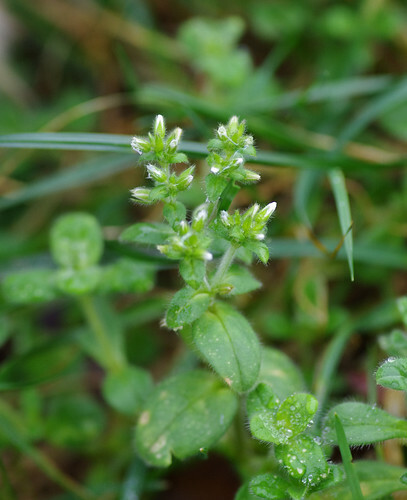 On the latter, I spotted this common weed. This species is capable of flowering all year round. 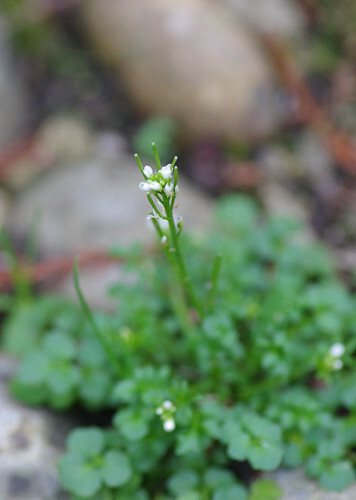 It has a more slender and straighter stalk than Wavy Bitter-cress. Bitter-cresses love the cracks in paths and pavements. Next time I see one in the garden I'll be much more inclined to leave it be than pull it out. We left the cafe and wandered back towards the car park. But there were still one or two surprises in store. 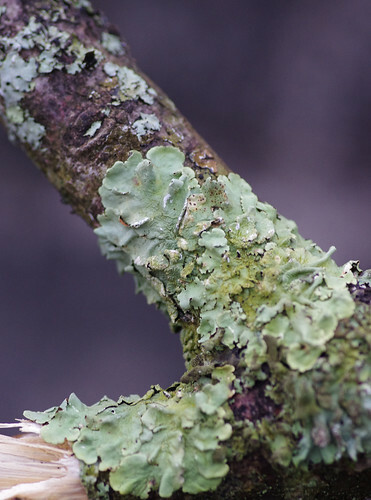 The lichens were intent on having the last word! 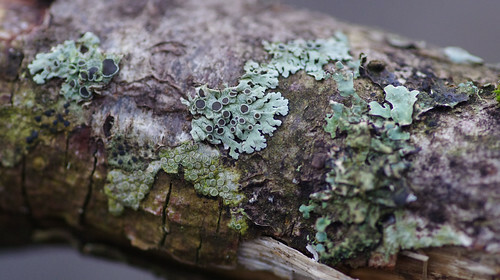 This has become one of our favourite lichen species. We have seen it frequently in the last few weeks. Sherry has captured it in a variety of guises. The lobes are relatively wide. I'm guessing this is a mature specimen. We usually see grey examples of Physica aipolia on fence posts and wooden railings so we were excited to see some green ones. 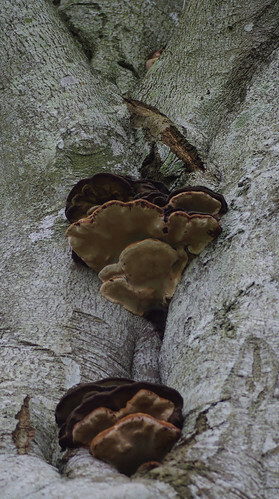 The black discs with green margins and the arrangement of lobes make this species relatively easy to identify. Below the specimen in the centre there is another that I haven't been able to identify yet. One last Flavoparmelia for the road.